Eight other communities were also named. They are Barrs Court, Lower Almondsbury, Olveston, Rudgeway, Thornbury town centre, Tockington, Tormarton and Warmley. 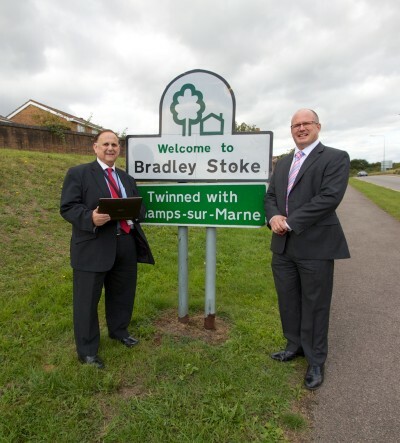 The first homes and businesses in these towns and villages will be able to order fibre broadband services by summer 2014. By the end of March 2015, 94 per cent of premises in South Gloucestershire will have access to superfast speeds of 24Mbps and above*. Councillor John Goddard, Chair of South Gloucestershire Council’s Resources Sub-Committee, said: “We recognise that high speed internet connections are vital for South Gloucestershire’s economic future, and for promoting business growth and encouraging inward investment, which is why we are delighted to announce that Bradley Stoke is our first town to benefit from the roll out of superfast broadband under this partnership. Today’s announcement marks a major achievement for this large and complex project. Fibre broadband is not currently available in most of Bradley Stoke, Lower Almondsbury, Olveston, Rudgeway, Tockington and Tormarton. The majority of premises in Barrs Court, Thornbury and Warmley already have access to the technology through BT’s commercial roll out and this project helps to fill in the gaps. It is also designed to ensure that all premises within the project area will have access to a minimum speed of 2Mbps by March 2016. The nine latest locations join Pucklechurch and Wick which were announced earlier this year as the first communities to be included in the partnership’s roll-out plans. The project is on track to enable more than 5,000 homes and businesses in South Gloucestershire to connect to fibre broadband by June 2014. Bill Murphy, managing director of next generation networks for BT Group, said: “This is another important milestone for a partnership which is making rapid progress. Working with our partners, we are able to bring this exciting technology to locations where the economics and engineering challenges are that much greater.